Featured in National Geographic’s “24 Unconventional Art Destinations Around the World”, this immersive art experience is sometimes referred to as “Photon Bombing,” “Guerilla Projection” or “Urban Projection,”. Artists around the globe have been using the latest design, animation and projection technologies for many years to cast dynamic images onto skyscrapers and other urban structures as a means of artistic expression. 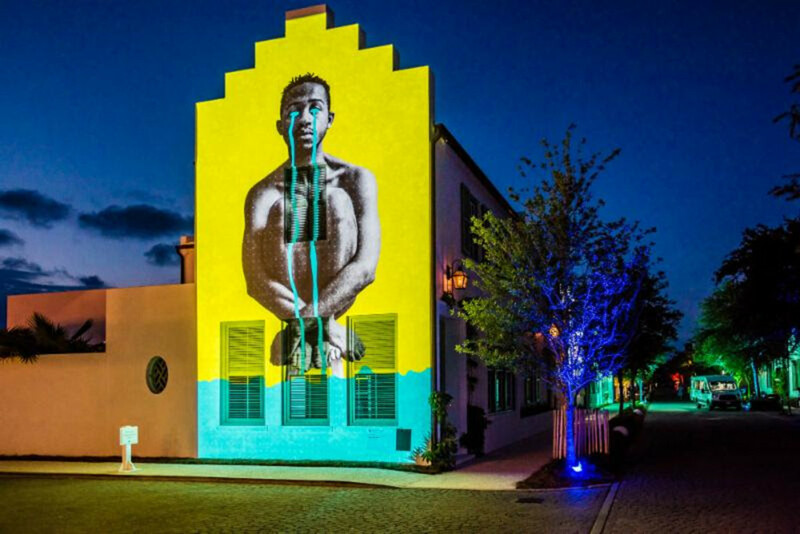 Digital Graffiti at Alys Beach is a festival geared towards bringing these artists together in one place to celebrate and showcase their unique talents in a stunning coastal community recently dubbed the third most beautiful small town by Architectural Digest. Each year, the festival attracts digital artists, filmmakers, interactive designers, photographers, VJs, and fans of art, design, technology, and architecture. Thousands of dollars in cash prizes are awarded to artists, with digital submissions being received from as far away as Israel, Austria, Canada, Germany, London, India, France, Italy and China. The 12th Annual Festival takes place on May 17-18, 2019. Opening night, Friday, May, 17, is our family-friendly night featuring our 2019 projection art installations. Local food trucks and vendors are located throughout the festival footprint, while the street party winds through Alys Beach from Highway 30A all the way to Caliza Pool & Restaurant. There, attendees can purchase à la carte food and beverage and experience fun for the whole family. This event is open to all ages. Saturday evening, May 18, is an all-inclusive food and drink experience, with stops along the festival’s path featuring samples by local and regional chefs, winemakers, distillers, and breweries. The evening culminates with desserts, spirits, and casual discussions of art around the pool at Caliza Pool & Restaurant, which will showcase additional artwork. This event is 21+. Tickets are $150 through April 30 and $175 beginning May 1.